Why This Counts: What Does the Future Hold for the Workforce? You or someone you know may be deciding on a career, whether just starting out in the workforce or looking to change jobs. If so, you may have questions about potential careers. BLS employment projections and our Occupational Outlook Handbook can help answer them. Even if you aren’t looking for a career change, you may be interested in a broader picture of the future of the U.S. economy and workforce. You can find this information, and much more, from the Employment Projections program. What’s a projection and how do you make one? A projection is an estimate of future conditions or trends based on a study of past and present trends. Every 2 years, the Employment Projections program publishes 10-year projections of national employment by industry and occupation based on analysis of historical and current economic data. The purpose is to offer some insight into questions about the future growth or decline of industries and occupations. We use historical and current BLS data primarily from the Current Population Survey, the Current Employment Statistics survey, and the Occupational Employment Statistics survey. You can see an overview of our six-step projections process. BLS is working toward releasing the projections each year, rather than every 2 years. What are some data highlights for the 2016–26 projections? The most recent labor force projections tell us about the impact of the aging of the population. As the large baby-boom generation (those born between 1946 and 1964) grows older, the overall labor force participation rate is projected to be lower than in previous decades. The labor force participation rate is the share of people working or looking for work. We project the rate to be 61.0 percent in 2026, compared with 62.8 percent in 2016 and 66.2 percent in 2006. This is because older people have lower labor force participation rates than younger age groups. The 55-and-older age group is projected to make up nearly one-quarter of the labor force in 2026, up from 22.4 percent in 2016 and 16.8 percent in 2006. The share held by the youngest age group—ages 16 to 24—is projected to continue to decline as they focus on their education. We can view employment projections in terms of the change in the number of jobs and as a percent change. The projected percent change represents how fast an occupation or industry is projected to grow. The chart below includes the top ten fastest-growing occupations from 2016 to 2026. Five of the occupations are related to healthcare, which makes sense with a population that is growing older. 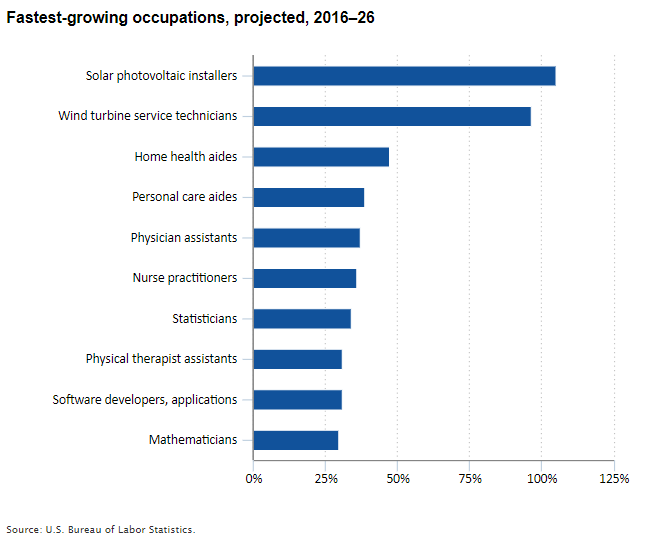 The top two fastest-growing occupations install, repair, and maintain solar panels and wind turbines. These two occupations are small in numbers but are both projected to double in size over the decade, reflecting the current interest in alternative forms of energy. The remaining occupations fall into what is known as STEM (science, technology, engineering, and math). What other information can you get from the Employment Projections program? BLS also provides information on the education and training path for occupations. What education do people usually need to enter an occupation? Does the occupation typically need work experience in a related occupation? Is specific on-the-job training typically needed? BLS provides this information for every detailed occupation for which we publish projections. We describe the typical path to entry in the base year of the projections. This education and training information, with the occupational projections and wages, form the basis of the Occupational Outlook Handbook. 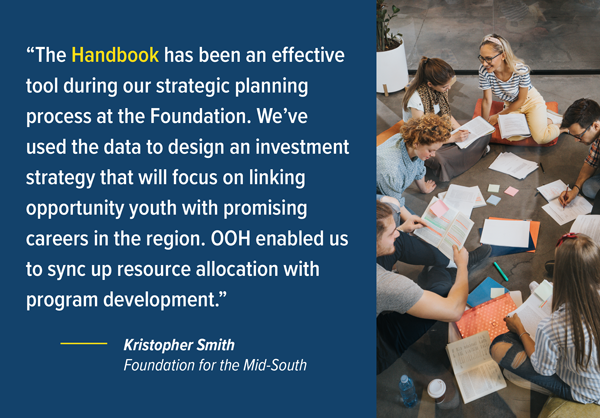 What is the Occupational Outlook Handbook? The Occupational Outlook Handbook has been around for nearly 70 years, and it is a trusted (and free!) source of career information. It incorporates BLS data and lots of other information about careers, along with tools to find the information you need. 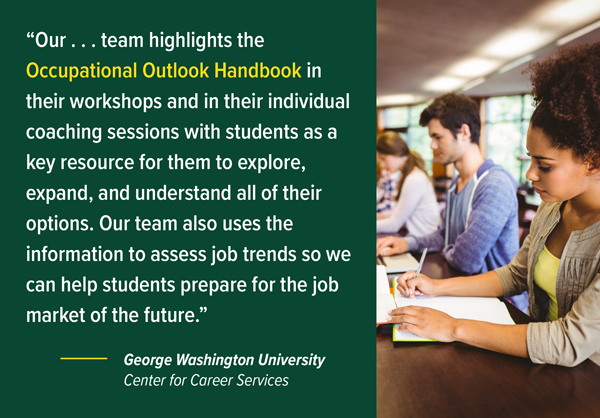 Another publication, Career Outlook, is published throughout the year and provides practical information about careers for students, career counselors, jobseekers, and others planning careers. Want to know about projections for your state or local area? While BLS makes projections at the national level, each state makes projections for states and local areas. Find information on state projections at Projections Central. Want more Employment Projections information? Check out the latest news release. Head to the Frequently Asked Questions to learn more. Or contact the information folks by phone, (202) 691-5700, or email. Changing jobs or starting a new career is a big decision. Use these gold-standard BLS data to help you make smart decisions, which could help you for years to come. Don’t be a buggy whip maker when everyone is riding in a self-driving car—or a rocket ship! Time is a limited resource. We have only 24 hours in a day to do everything we want to do, along with everything we need to do. Caregivers may be especially pressed for time, spending time not only on their own needs, but on the needs of their children or aging family members or friends. Today I want to focus on care for the elderly. Sixteen percent of the population, amounting to 41.3 million people, provide unpaid eldercare in the United States. About one-quarter of this population provides unpaid eldercare on a given day, spending an average of 2.8 hours providing eldercare. Think about it. That’s almost 3 hours of the day spent caring for someone else—and that doesn’t even count the hours some eldercare providers spend caring for children! We know this because the American Time Use Survey includes questions about unpaid eldercare. Eldercare commonly refers to the informal or unpaid care that family members or friends provide aging adults, although it can sometimes include formal or paid care. The number of people age 65 and older is expected to rise dramatically over the next two decades. The number of years elderly people live with chronic conditions due to longer life spans is also expected to rise. Because of this, there is wide interest in understanding how much time Americans devote to unpaid eldercare and how it affects caregivers’ lives. Editor’s note: A text-only version of the graphic is below. Let’s take a closer look at eldercare providers using the 2015–16 American Time Use Survey data. The majority (56 percent) of eldercare providers are women. People ages 55 to 64 are the most likely to provide eldercare (24 percent), followed by those ages 45 to 54 (21 percent) and those ages 65 and older (19 percent). Sixty-one percent of eldercare providers are employed. Four million people are parents of children under the age of 18 and also provide care for their own parent. These people sometimes are called members of the “sandwich generation,” because they are between two generations that need care. For whom are they providing care? Thirty-nine percent of eldercare providers care for someone age 85 or older, while 14 percent provide care for someone ages 65 to 69. Most eldercare providers ages 15 to 34 care for a grandparent. Providers ages 35 to 64 are more likely to care for a parent than are caregivers who are younger or older. Providers age 65 and older are more likely to care for a spouse. 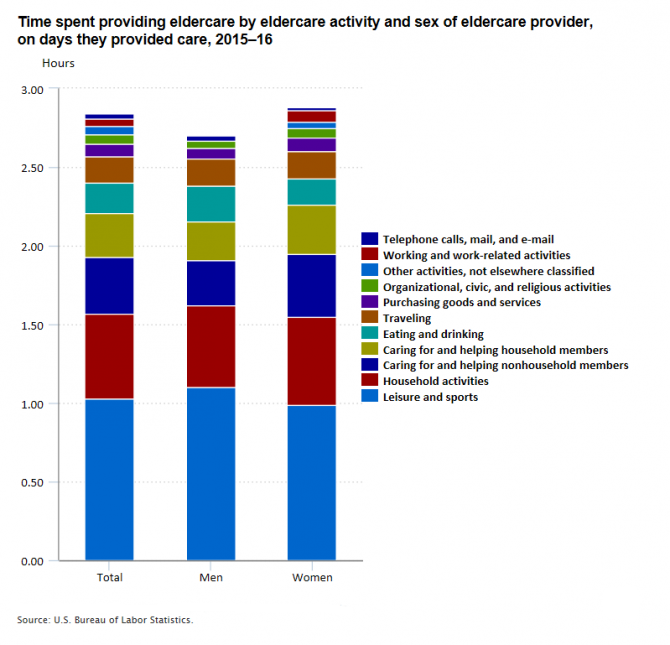 How much time are they spending on eldercare? Eldercare providers who care solely for someone with whom they live spend an average of 2.2 hours per day providing care. On weekdays they provide care, employed caregivers spend an average of 1.8 hours doing so. Among caregivers, women are more likely than men to provide eldercare on a given day. On days they provide eldercare, however, men and women spend about the same amount of time providing care. What types of eldercare activities are they doing? When we think of eldercare, it might be easy to think of just the physical care. However, eldercare may include nearly any activity. Providers care for their family and friends by helping with grooming, preparing meals, providing rides, and more. They also provide companionship or remain available to help when needed. On days they provide care, 37 percent of eldercare providers prepare food, perform housework, or engage in other household tasks. Eldercare providers spend an average of 1.0 hour in caregiving associated with leisure and sports on days they provide care. This includes socializing and communicating. This is just a snapshot of the eldercare information available from the American Time Use Survey. Find out more about unpaid eldercare in the United States. (1) Estimate is not shown because it does not meet the American Time Use Survey publication standards. Editor’s note: The following has been cross-posted from the U.S. Department of Labor blog. The writer is Ann C. Foster, an economist at the U.S. Bureau of Labor Statistics. Older households are more apt to be homeowners (79 percent) than younger households (57 percent). Please note: By “older households,” we mean those with a reference person (often the principal homeowner or renter) 65 years and older, and by “younger households” we mean those with a reference person under 65 years. Housing is the greatest expense, both in dollar amount ($15,529) and as a share of the household budget (34.8 percent) among older households. Older and younger households are similar in that 85 percent of older households and 88 percent of younger households own or lease at least one vehicle. Transportation expenses among older households, however, are lower in dollar amount ($6,846) and as a share of the household budget (15.3 percent) compared with younger households ($10,310 and 17.4 percent, respectively). That’s probably because older households have fewer earners and would be less likely to have job-related transportation costs. Because older households have fewer earners, pensions and Social Security costs are much lower in dollar amount ($2,401) and as a share of the household budget (5.4 percent) among older households compared with younger households ($7,118 and 12 percent). 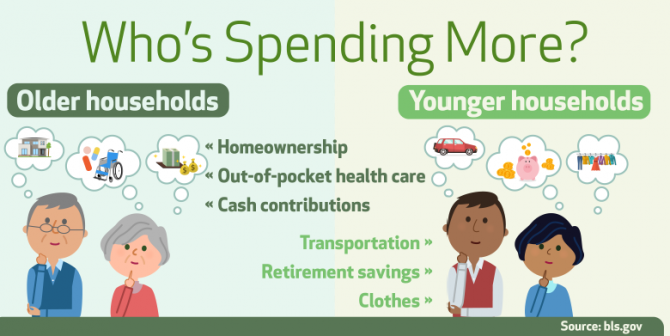 Out-of-pocket healthcare expenses are higher in dollar amount ($5,766) and as a share of the household budget (12.9 percent) among older households compared with younger households ($3,912 and 6.6 percent). Clothing is often a job-related expense that should decrease when household members retire. This could be one reason clothing expenses are lower among older households ($1,060 and 2.4 percent) than younger households ($2,079 and 3.5 percent). Cash contributions (everything from charitable donations to child support payments) among older households are higher: $2,287 and 5.1 percent, compared with $1,676 and 2.8 percent for younger households. Social Security, private pension and government retirement payments account for more than half (51.3 percent or $23,912) of the pretax income of older households. Among younger households these sources account for only 3.8 percent ($2,900) of pretax income. Editor’s note: The following has been cross-posted from the U.S. Department of Labor blog. The writer is Emily Rolen, an economist at the U.S. Bureau of Labor Statistics. Tens of millions of babies were born in the United States between 1946 and 1964, and by 2024, nearly 70 million people will be between the ages of 60 and 78. People age 65 and older are projected to make up 23 percent of the civilian noninstitutional population in 2024, up from 18.1 percent in 2014 and 15.5 percent in 2004. As the population ages, they’ll need more workers to care for them in nursing care facilities, retirement communities, or at home. As a result, occupations related to eldercare are projected to be among the fastest growing in the economy over the next decade. 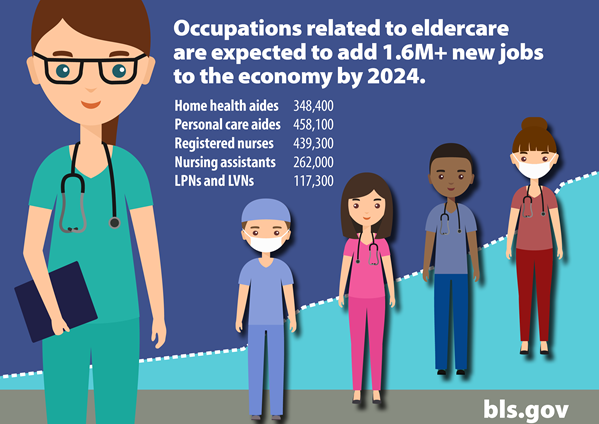 In fact, home health aides, personal care aides, registered nurses, nursing assistants and LPNs/LVNs are projected to add more than 1.6 million new jobs by 2024, or about 1 in 6 new jobs added to the economy. Let’s take a closer look at some of these jobs. Home health aides and personal care aides help older adults, as well as people with disabilities or cognitive impairment, with self-care and everyday tasks like bathing, housekeeping and meal preparation. Home health aides also provide basic health-related services, such as checking vital signs or administering prescribed medications. However, personal care aides cannot provide any medical services. Both occupations work in clients’ homes, long-term care settings, and residential care communities. Home health aides and personal care aides typically do not need formal education, but most have a high school diploma or equivalent. Both learn their jobs through a brief period of on-the-job training. 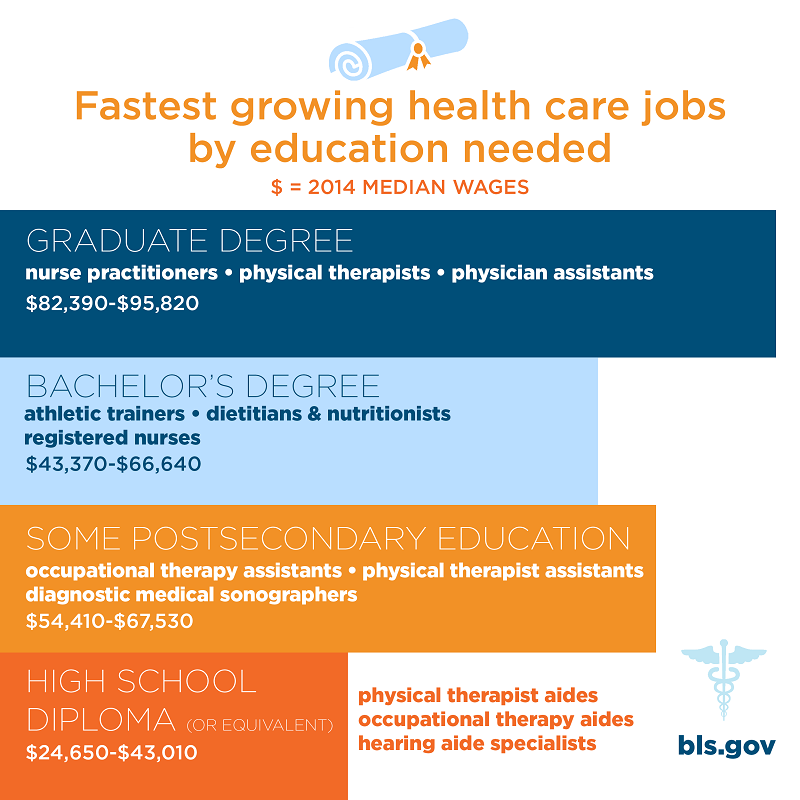 Home health aides are projected to be the fifth-fastest growing occupation between 2014 and 2024, with more than 348,000 new jobs. Personal care aides are projected to add more than 458,000 new jobs between 2014 and 2024, more than any other occupation. Nursing assistants and licensed practical nurses and licensed vocational nurses work primarily in nursing homes and in hospitals, where they provide basic care. They help patients with activities of daily living, such as bathing, using the toilet and getting dressed. Nursing assistants and LPNs/LVNs listen to their patients, record health concerns and report that information to registered nurses and doctors. Depending on their work setting and the state in which they work, LPNs/LVNs may be allowed to perform additional tasks such as giving medication, starting intravenous drips, or doing routine laboratory tests. Nursing assistants and LPNs/LVNs typically need a postsecondary nondegree award to enter the occupation. LPNs/LVNs must also have a license. 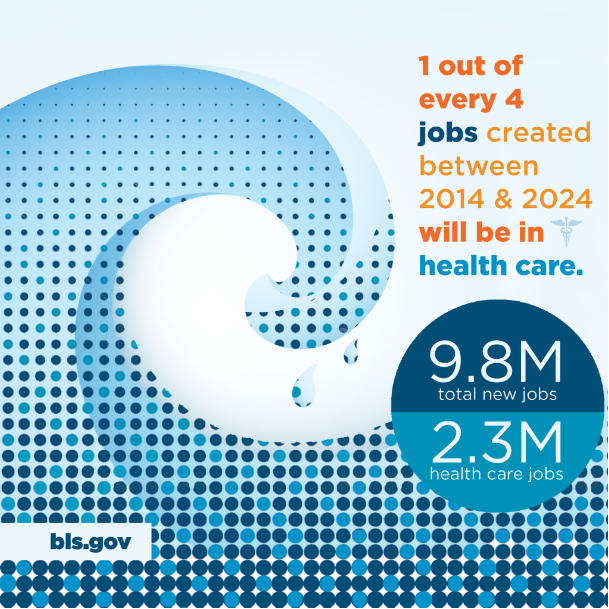 The economy is projected to add 262,000 new nursing assistant jobs by 2024, and LPNs/LVNs are projected to increase by more than 117,000. Registered nurses, the largest healthcare occupation, provide and coordinate medical care. In 2014 more than 3 in 5 RNs worked in hospitals. They observe patients, help perform diagnostic tests and analyze the results, and set up plans for patients’ care. Some registered nurses oversee licensed practical nurses, nursing assistants, and home health aides. RNs are projected to add 439,300 by 2024, the largest increase after personal care aides. RNs usually take one of three education paths: a Bachelor of Science in Nursing degree, an associate’s degree in nursing, or a diploma from an approved nursing program. Want to know more? Explore these occupations and many more in the Occupational Outlook Handbook. Editor’s note: The following has been cross-posted from the U.S. Department of Labor blog. The writer is Michael Wolf, chief of the Division of Occupational Employment Projections at BLS. Healthcare jobs have a bright outlook. 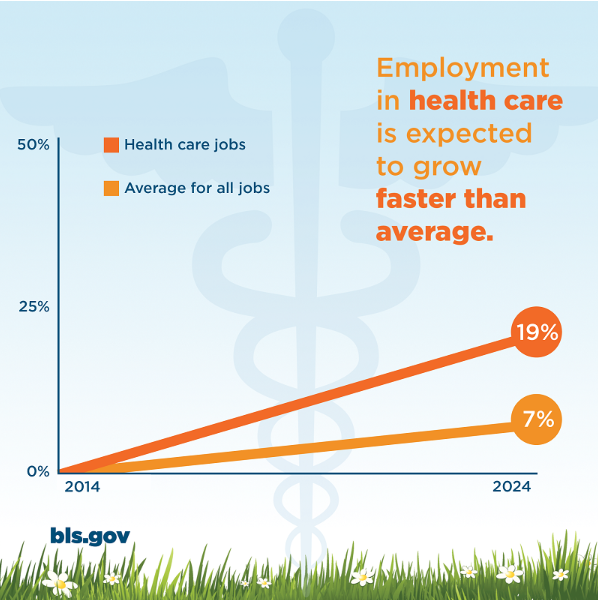 In fact, about 1 in every 4 new jobs added to the economy between 2014 and 2024 will be in healthcare fields, according to Bureau of Labor Statistics projections. What’s behind this wave of growth? A couple of factors: The baby boom generation is aging and people are living longer, so there will be more older people who need healthcare services to remain healthy and active. Also, rates of chronic conditions like diabetes and obesity are growing, so more healthcare workers will be needed to help care for people with conditions like these. And because more people have health insurance due to federal health insurance reform, they’re also more likely to use healthcare services, increasing the demand for many kinds of healthcare workers. Healthcare job opportunities are found across all education levels—from graduate degrees to just a high school diploma. However, wages are typically higher for those that need more education. Explore these jobs and many more using the online Occupational Outlook Handbook at www.bls.gov/ooh. Need help finding a job or changing careers? Visit your local American Job Center or explore our online resources.